In a chapter titled “A Dead Rotting Rodent”, acid attack survivor Reshma Qureshi writes, “What most people go a lifetime without enduring, I had endured in less than six hours.” We are six chapters into Being Reshma. She was just 17 on that fateful day in 2014 in Allahabad, when two men pulled her hair back, pinned her to the ground, doused acid on her face and vanished. The sentence is a punch in the gut for the reader. Not because it powerfully conveys the ferocious, cold-blooded nature of the crime, but because of all the events that led to it and what follows after. Reshma is attacked and the immediate hours are spent running around trying to enter an emergency ward, struggling to file an FIR, smug officers blaming the victim in her presence, precious hours wasted with ill-advised first aid, being told by the next hospital about their ill-preparedness to deal with serious burns, wild screams, nausea and blinding pain—back-to-back catastrophes comprise those harrowing six hours. But a young teenage Reshma has already had close encounters of the fatal kind before this. Born to a taxi-driver father, Reshma grew up in a single room on the second floor of a chawl in East Chembur, Mumbai. This was shared by her parents and four older siblings. As a preteen, she saw her mother almost die of cancer. The treatment, needless to say, sapped resources to the extent that her two elder sisters dropped out of school. The women in the family then moved to their paternal house with no electricity, in a small town in Uttar Pradesh, to cut costs in an expensive, big city. One of the sisters is almost burnt alive at the hands of her in-laws when she musters enough courage to gather her children and run. "She reeked of kerosene. Then it hit me: she was drenched from head to toe in kerosene," Reshma recollects. Her sister's husband, Jamaluddin, kidnaps his own son from school after spewing the words "talaq, talaq, talaq". The day of the acid attack is also the day when the cops are supposed to hand over the child to the mother. Jamaluddin and his cousins orchestrate the heinous crime when Reshma and her cousins are headed to school for an exam. Just after these episodes early in the book—recounted in smooth, swift prose—if a reader were to flip to the inset images of Reshma as an award-winning activist and campaigner sharing beauty tips, walking the ramp at the New York Fashion Week and posing with Shah Rukh Khan, Sunny Leone, Caitlyn Jenner in Beverly Hills, it hits you again. 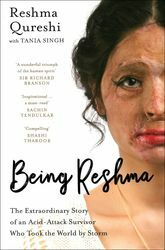 Being Reshma is a vital read to get some perspective on privilege and people who actually live difficult lives.